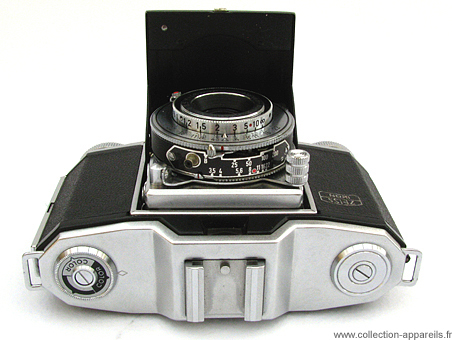 The Contina 35, also called Contina I, remains a mystery since it is exactly similar to the Ikonta 35. 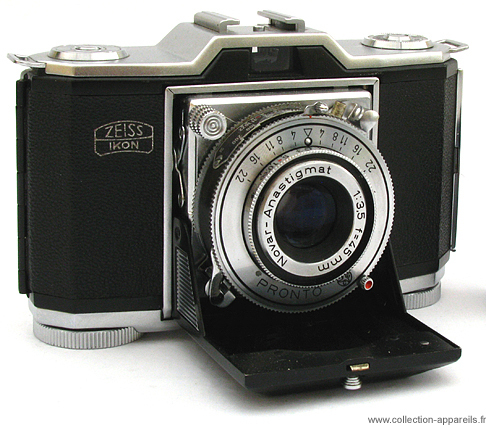 It has, and it is one of the rare cases at Zeiss Ikon, the same reference for two different names. The konta 35 appears in 1948, just after the war and will have produced until 1953. The Contina 35, to it, will appears only in 1951 for an end of production in 1955. Two identical cameras under two different names put in competition, was that a strategy to reach others markets? It is a camera 24 x 36, very compact, of low-weight: 450 grams! but of good manufacture. It is presented here with a Novar lens 45 mm opening with 3.5 coupled to a Pronto shutter which post speeds from the 1/25 with the 1/200 second which can receive a cable release. “Always ready to work immediately, always with full success, The Contina 24 x 36 represents the ideal camera for the rapid instantaneous in black and white as well as colours. If one makes the focusing, for example, on 5 meters, while opening the diaphragm with 8, all is sharp from 2.50 to 25 meters, which offers a field sufficient for the instantaneous cliché to take, so to speak, by surprise. It is besides always these which are the most sharp. The devices with which this camera is equipped set free the amateur from any worry: locking against the double exposure and the premature rolling up of[film, focusing on red reference mark, cocking on the body facilitating the shot of the successive clichés, and possibility of controlling all the adjustments, on top, at a single look. The scales of depth of field are them also provided. The lens, with excellent chromatic correction (essential point for the coulours clichés) are treated by anti-reflecting coating. The shutter (from 1 to 1/300 second with 1/500 second on Synchro-Compur) includes a synchronized contact-flash. That one works hastily or with caution, in black and white or colours, The Contina small format gives itself with all the requirements”.